Prizes won at Wireless Power Week 2018! The team won the best hardware demo award with the wirelessly powered drone, which can hover without a battery in proximity to the charging pad [link video]. In addition, Juan M. Arteaga won the first prize paper award in the student paper competition of IEEE-PELS WoW. Samer Aldhaher and Juan M. Arteaga presented their work in WPTC & WoW and Paul D. Mitcheson was part of a very interesting panel discussion with other academics and industrialists. Prizes won at APEC 2018! 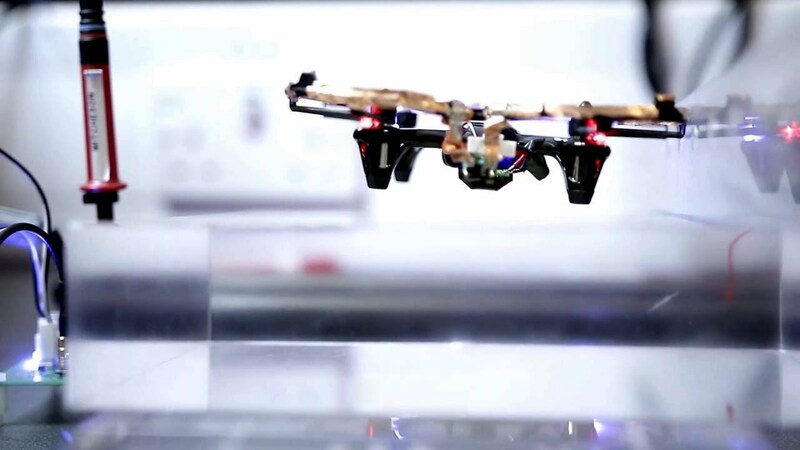 Dr Samer Aldhaher's demonstration of a battery-less quadcopter drone being powered wirelessly whilst it is flying has been covered by various media outlets including BBC Click and CNC News in China (English, Chinese). A YouTube video of the original demonstration can be seen below. Professor Paul Mitcheson joined Red Dwarf actor and technology presenter Robert Llewellyn in a panel discussion at New Scientist Live 2016 (22-25 September 2016) , a major four-day festival of science, technology and engineering at the ExCeL exhibition centre in London. The discussion centered around electric vehicles, during which questions such as how do electric vehicles work, how will we charge them and what will they cost were raised. The event was attended by 450 festival visitors and featured demonstrations of the principal technologies involved. PhD students George Kkelis and Juan Arteaga Saenz, supported by researchers David Yates and Samer Aldhaher and supervised by Paul Mitcheson, won the first annual Geoff Haynes GaN Systems Challenge for their innovative use of wide bandgap devices in high frequency wireless power transfer systems. The award in honour of Geoff Haynes, recently retired co-founder of GaN Systems, was presented to the team by Girvan Patterson, President of GaN Systems. Girvan Patterson, Paul Mitcheson, Samer Aldhaher, David Yates, Juan Arteaga Saenz, George Khelis and Geoff Haynes at the GaN Systems Geoff Haynes Future Power Challenge 2016 award ceremony. Dr Samer Aldhaher won 3rd prize for his poster presentation on 'Load-independent Class EF inverters for wireless power transfer' at the 'EPSRC Centre for Power Electronics: Annual Conference 2016' in Nottingham, UK (5-6 July 2015). The Wireless Power Lab exhibited as part of the EPSRC Centre for Power Electronics at the Cheltenham Science Festival on 7-12 June 2016. The paper "Load-independent Class EF inverters for wireless power transfer", presented by Dr Samer Aldhaher, was awarded second prize at the 2016 IEEE Wireless Power Transfer Conference (WPTC) in Aveiro, Portugal (5-6 May 2016). A total of three awards were won at the 'EPSRC Centre for Power Electronics: Postgraduate Summer School 2015' that took place at Newcastle University, UK (2-3 September 2015). PhD students James Lawson and George Kkelis each received best poster presentation prizes, whilst George Kkelis also scooped third prize for his oral presentation titled 'Power Electronics for Inductive Power Transfer Systems'. The paper "Link efficiency-led design of mid-range inductive power transfer systems', presented by PhD student Christopher Kwan, was awarded 'Best Paper' at the 2015 IEEE PELS Workshop on Emerging Technologies: Wireless Power (WoW) in Daejeon, South Korea (5-6 June 2015). The paper "Comparison of current driven Class-D and Class-E half-wave rectifiers for 6.78 MHz high power IPT applications", presented by PhD student George Kkelis, was awarded 'Best Student Paper' at the 2015 IEEE Wireless Power Transfer Conference (WPTC) in Boulder, Colorado, USA (13-15 May 2015). Wireless power transfer (WPT) is foreseen as a key enabling technology for energy-autonomous wireless sensors, Internet-of-Things and Device-to-Device communication. RF energy, either scavenged from the ambient or intentionally provided to a wireless device, can be successfully exploited for autonomously sustaining its operations. In this lecture, the end-to-end circuit level co-design of a WPT link was described as the procedure to effectively address the system optimum efficiency. Specific selection of antenna elements and active sub-circuits were analyzed, depending on the power levels involved and on the specific application environment. The base-band design of the power management, unit used to dynamically provide the receiver with optimum loading conditions, was also analyzed. Finally, representative results for both communication and energy harvesting activities, combining UWB and UHF technologies for next generation RFID-enabled sensor systems, were discussed. Alessandra Costanzo, M (99), SM (13), is Professor of electromagnetic fields at the University of Bologna, Italy since 2001. She has developed innovative software tools for the nonlinear/electromagnetic co-simulation of RF systems, under modulated excitations. Her main research interests concern circuit-level nonlinear analysis of MIMO and UWB links, including radiating elements and realistic channel models. She is now involved in designing energy-autonomous systems adopting far- and near-field wireless power transfer technologies. She is co-funder and MC member of the EU COST action WiPE “Wireless power transfer for sustainable electronics” where she chairs WG1: “far-field wireless power transfer”. She is TPC member of the IEEE MTT-S IMS, EUMW, WPTC, RFID-TA and ICUWB symposia. She chairs MTT-26 on Wireless Energy Transfer and Conversion and she is MTT representative of the CRIFID. Prof. Costanzo is contributor to several books, (co-)author of about 150 journals international conferences papers and holds three international patents. Grant A. Covic (S’88–M’89–SM’04) received the B.E. (Hons.) and Ph.D. degrees in electrical and electronic engineering from The University of Auckland (UoA), New Zealand, in 1986 and 1993, respectively. He was appointed as a full-time Lecturer in 1992, a Senior Lecturer in 2000, an Associate Professor in 2007 and to Professor in 2013 within the Electrical and Computer Engineering Department, UoA, New Zealand. In 2010, he Cofounded (with Prof. J. Boys) a new global start-up company “HaloIPT” focusing on electric vehicle (EV) wireless charging infrastructure, which was sold in late 2011. Presently, he heads power electronics research at the UoA and co-leads the interoperability subteam within the SAE J2954 wireless charging standard for EVs. Today his research and consulting interests include power electronics, electric vehicle battery charging and inductive (contact-less) power transfer (IPT) from which he has published more than 100 refereed papers in international journals and conferences. He also holds a number of US patents with many more pending, from which licenses in specialized application areas of IPT have been granted around the world. Wireless power transfer is known from the charging of an electric toothbrush and maybe from the wireless charging devices for smartphones, tablets, etc. Charging distances for these devices are limited to a few millimeters. Power transfer is also possible over larger distances, but with less power. Notwithstanding this it is feasible to realize autonomous, wireless sensors without using batteries. Power is being ‘radiated’ by a central transmitting station. In this presentation the specifics of such systems were discussed. This was done through going through the history of radio, the history of wireless power transfer and the current state of the art. The presentation concluded with future perspectives for radiative Wireless Power Transfer.